Angela can also be booked for speaking engagements through Booked Out Speakers Agency. It was a colourful, interesting, lively and well-paced talk. The audience enjoyed hearing about the craft of writing, the many considerations that go into building a story and some of the problems writers must face along the way. Your talk was well-organised but it felt relaxed and gave you room to respond thoughtfully to people’s questions. I think it was one of the best author talks at the library. I was to have called you today to have a chat for a profile we are doing about you in Victorian Lifestyle magazine – through Michael Williams at Text Publishing. Unfortunately I seem to have the wrong phone number for you and Michael is not answering his mobile so I can check the number. So, would you be around tomorrow at all and can I call you then? I am in Sydney all day but should be able to speak some time and will fit in with you. Alternatively, I could put some information together from all the media information I have found about you and email to you so you can fill in any gaps. What I would like to include is some of your thoughts on living in Melbourne and Victoria now that you have returned and a bit more of your plans for your creative and writing future. So, let me know if that’s ok – my email address is frantrb@optusnet.com.au and the mobile number is 0403 133 063. I won’t have access to emails from early tomorrow until Sunday morning, but will be checking them until late tonight. Back in Melb tomorrow after 7 weeks travel…..have read review #1 and await others. Hope all OK for Sunday night even though you are a celeb. Will buy copies of book this week! Do you have an email mailing list, so readers can be alerted when your next book is released? If so, may I be added to it, please? You probably don’t remember me. We met in Vientiane when I was up there working with AusAID. I hung out with our mutual friend Doravann Di. Congratulations on your first book – I picked up a copy at Brisbane Airport, having noticed your name on the cover. I enjoyed it, and recognised a lot of cultural comment and location stuff. Keep writing and contact me on the supplied email if you want. You may have heard of her, or you may bump into her at the odd writers festival or two. Congratulations on your novel Angela. Like Bill, I picked it up because I recognised your name, but couldn’t put it down until it was finished (1am!!). It was a great to read good fiction from the world of expat life and international development – the characters were very realistic and elements of them recognisable, but the crime genre is always a great escape!! A published book. Fantastic. What a wonderful achievement. But do you think The Police should be doing a reunion tour? i thought i’d look you up on the web, found your site, love your site. how cute is natasha! hope you’re all well. think of you all often. oh matt proposed, i’m engated. Just to let you know I enjoyed your session at the Williamstown Festival yesterday. I bought a copy of your book and started it last night – so far so good. I’m writing a short piece on the Crime Writing Panel in my own blog, should be posted later today. Could you email me regarding the possibility of writing a story for a potential anthology, please. Hope to hear from you soon. After regretting not asking you more about your writing in our brief meeting at Boatnoodle restaurant the other day I searched and found you on the web – an amazing world! It’s been a while since I got lost in a crime thriller so tomorrow I’ll try to get a copy of Behind The Night Bazaar! Let us know if you’d like a trip to meet our family in Prey Veng while the three of you are here. I always have to have two goes! Put my message under ‘work in progress’!!! Will not repeat here. Take care of yourself … hope all is well with the family. Remember me…….Moop. I found you on a website, and was quite overcome. Would love to hear from you after all these years. Where are you now? In Vietnam? Hows Natasha? I am just visiting your website. I am sorry I couldn’t write before. I have been very busy settling back in Mexico. I hope you are having a great time. When are you going back to Melbourne??? Well, give Natasha a big cuddle for me. I am wondering if I could get your permission to reprint your article “ ‘Vectors’ and ‘Protectors’: Women and HIV/AIDS in the Lao People’s Democratic Republic” in an anthology to come out with Routledge titled ? I have a formal letter that I send you outlining the nature of the publication …. probably not great content for your Blog! But this is the only way I have managed to track contact details for you. Is there any chance you can email me at Louise.Edwards@uts.edu.au? I can then send you the formal letter for your consideration. Trying to find you. Fr. Brian Stoney died today. 12/11/8. Wanted to let you know. Just wanted to talk to you and hear you dopey. Not even sure why. Never stopped loving my correspondent from Paris, my first lover, and always my soulmate…you only ever get one. I always have ange. Just wanted to let you know about Brian. Love and care to you whatever you are doing and to your family. Probably not right to send to blog, but delete if called for of course.For some reasonwanted to tell you about Brian. I hope I am going to be able to speak at the funeral. PS. Photo of you. You are unchanged. Me too. Su’ursdai chhnam thmai barang! Stumbled across your website. I recall when fiction-writing was high on the intention list. Seems you have burst into the genre from the above comments. Congratulations. I will certainly track down the title. What is happening in your life? My name is Frank, I am publisher and I’d like to know whether you have or not agreements for publishing your books. 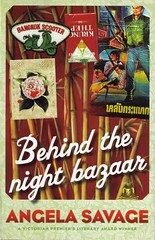 I read “Behind the Night Bazaar” time ago and I liked it a lot. I was regarding the possibility of getting you to review one of our upcoming titles. If you could please email me to discuss this opportunity further I would be much obliged. Can you contact me on my email re an invitation to you to participate in an event for emerging writers. Wow! Angela, a published author. Congratulations. It looks like you are still a high achiever. After so many years back in Oz I am beginning to explore getting involved again in development work in Asia – perhaps back to my roots with the Karen people on the Thai Burma border. I am glad to know you are still living big dreams. I’m a children’s book author living in Thailand. You can Google my name along with “Mubu & Mu-Mu, the Little Animal Doctor,” and see more about me. I assume you are the Angela Savage who took the tiger cub photos at the Melbourne Zoo. We would like to use your photo in our latest Mubu book (which includes a segment about a tiger). Profits are shared by the non-profit Elephant Nature Park and myself (profit). We would be happy to give you a photo credit, and if a book of yours is appropriate for children, we’ll say something about it. Also if you have a tiger in the wilds photo, preferably drinking from a stream, we need that, too. Thanks for your message. It’s always great to receive positive feedback from readers, especially one like yourself who knows Thailand well. I’ve been a regular visitor since 1985 and lived in Bangkok in 1997-98. Much of the material on Pattaya comes from visits I made in the 1990s, and again in 2008. My most recent trip to Thailand was earlier this year, to do research for the next book, which is set in Krabi and Nakhon Si Thammarat. I don’t pretend to be a Thai expert by any stretch of the imagination: with each visit, I realise how much I don’t know about the place. But in my books I try to capture something of what makes the country and its people so unique. 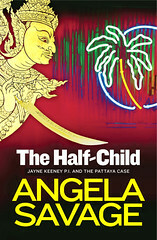 Do let me know your final verdict on The Half-Child once you finish it. Thanks so much for your message. Good to hear you enjoyed The Half-Child. You might like to read my first novel, which is available in German translation as Nachtmarkt. You can find more information about it here. I met you when watching the Oscars earlier this year at Spiro’s house. I didn’t know you were an author until I cam across your book The Half-Child recently at the Preston library. Well, I borrowed it and could not put it down. I would not normally read a book about a detective in Bangkok but your book was so exciting, engaging and so well written that I now have to go back to your earlier book, Behind the Night Bazaar. Thanks for a good read and let me know if you have a new book coming out. What a lovely message. Thanks Leon. I am so pleased you enjoyed The Half-Child. 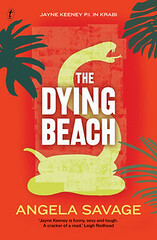 I hope my next book, working title The Dying Beach, will be published in 2012-13. See you at the next Oscars night? I plan on being at the Oscar’s night again next year, so hopefully I will see you there. You don’t know me but I just wanted to say that I really like your website. As it is with googling (is this a new verb?) I came across your page looking for literature on Australian female criminals. I am familiar with the razor gang women and mention Nellie Cameron in my cabaret “Partners in Crime”. It’s also a coincidence that I just wrote a cabaret show for Thanet Arts in Kent, UK for their “Warming Words” literacy season. It’s called “Ink: letters and lyrics” on the slow death of the written letter. Thanks for dropping by. I’m so glad you did. I had a look at your site and some video clips on YouTube and I love your Partners in Crime cabaret! Any plans to bring it to Melbourne? 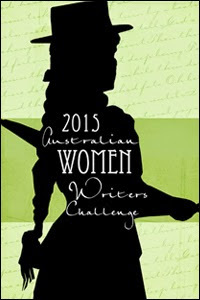 It is a coincidence that two of your shows deal with topics covered on this blog: Australian female criminals and the slow death – or as I prefer to think of it, enduring power – of the written letter. Did you also notice my post on Best crime stories in a song? Ode to Billie Joe made my Top 10, a song I see you perform in your show. Clearly we are destined to meet some day. I’ve just finished “The Half-Child” and I read “Behind the Night Bazaar” a couple of months back. I’ve never been to Thailand, but your books made it feel like I had. I’ll be looking out for your next novel and I hope that it is not too far away. I’m hoping that Jayne will still be the star. I like female PIs and Jayne is terrific. (Tara Sharpe is pretty hot too.) I’m a bit concerned that Jayne is beaten up or worse in both books. As a rule the good guys should win most of the fights. This is a serious problem for Cliff Hardie who gets knocked unconscious in just about every Corris novel: after about 20 novels and 20 beatings, Cliff ought to be seriously brain damaged. His liver, lungs and prostrate should be cactus as well. I hope Jayne is going to make some good money from being a PI. VI and Kinsey have been in the business for a long time and are only now beginning to make a reasonable living. It’s a tad depressing when paying their bills is usually a struggle, and one wonders why they persist if life is so precarious. Anyway, it’s good that Jayne seems at least to be solvent. Thanks so much for dropping by. Your fan mail made my day! Rest assured Jayne Keeney PI will be back. I am currently working on book #3, hoping for an early 2013 release – assuming my publisher likes it, of course. Working title is The Dying Beach. I’m afraid Jayne sustains a few new injuries in this one (and narrowly avoids others), though her finances are starting to look better, thanks to her talented new business partner. No doubt she’ll need to give up smoking some day, too, as Cliff Hardy did. But I’ll let her get away with it for a little while yet. Thanks again for taking the time to write. It is much appreciated. I recently finished reading “The Dying Beach”. Good to see that Jayne is making a little money and her business is growing. Just when I thought the plot was getting a bit predictable about half way through, it suddenly changed in a completely unexpected way. The ending had a nice twist too. A really good read and hope to see more of Jayne before too long. Thanks so much for dropping by to share your feedback on The Dying Beach. Comments like yours are what motivates me to get back to writing the next book in the series. Hi Angela, I have just linked to your site from mine – under ‘writing + mothers’. Is there any chance of exchanging links so I am on your blogroll? Hi Kirsten, will add you to the blogroll now. Have been away and can’t manage the site so well via iPad! Hi Angela, Fantastic blog. I just read about Behind the Night Bazaar. Any way you know of to get it in paper over in the States? I see it’s at Amazon on Kindle, which I may end up doing. You should know that a used paper copy is available at Amazon for US$173. Yes, that’s right. And any way to access your short story for which you won the Scarlett Stiletto? Thank you, Angela, for travelling to Geelong for this evening’s very informative and interesting Author Talk! The hospital is called the Chao Phraya Abhaibhubate Hospital. It’s a wonderful place and I hope you’ll get to see it one day. Hi Lee. Thanks so much for coming along to the Belmont Library tonight and for following up with the link to the Chao Phraya Abhaibhubate Hospital. It looks fascinating – I do hope to get the chance to visit someday soon. Please let me know what you think of The Dying Beach. Some of this involves some very poor decisions by our richest woman! Angela, met Friday 16 Aug., flight to Melb. Loved chatting to you briefly and have just booked tickets for Bne Writers Festival for your session. I really enjoyed meeting you, too, and thanks so much for the lift into Melbourne. Trust you enjoyed your weekend. I’m delighted to know we will cross paths again soon at the Brisbane Writers Festival. Wonderful to see you again at the BWF, great session, thank you! Since them I have read books 1 and 2 and am about to start your 3rd. I love them, so much that I hated having to put them down to do other things. I am also enjoying learning a little about Thailand. Congratulations to you on these great reads. Thanks for the wonderful feedback, Kay. I am so pleased you are enjoying the books, and if you feel like you are learning a little about Thailand as you go, then that makes me happier still. It was great to see you looking so well at BWF. I do hope our paths cross again in the near future. C0ngratulations on making the shortlist for the Ned Kelly and the Davitt! Thanks Anne. I’m thrilled to bits! Sent you a link to a long New York Times article on the intracies of surrogacy in the U.S. through your email. Also, wondered if you’d read “Laboring,” or if your midwifery student friend had seen it. I’m starting to feel a little Jayne Keeney deprived. I’m hoping that we are going to see more of Jayne before too long. Any news on this front? Thanks so much for your comment and apologies for the belated response. I do have plans for Jayne Keeney (and Rajiv Patel), though I am currently preoccupied with trying to finish off my PhD (in Creative Writing). Once that’s done — hopefully later this year — I hope to spend some time again with Jayne. A PhD is worth having if you are seeking an academic career, otherwise its almost always a waste of time (and money). My own PhD was in in econometrics and I must say that it did enhance my career. An academic career is OK, but you are a pretty good writer and I’m sure, considering what I’ve seen from you, that you could well hit the big time. I’m thinking Ben Sanders and Candice Fox. You have a great talent, so please, finish the PhD and write another memorable novel. What a great vote of confidence – thanks Dr Al. I’m on the PhD home stretch now. Only a matter of weeks to go. I hope to publish the novel I’ve been working on as part of this process, although it is not part of the Jayne Keeney/Raj Patel series.